I have stopped in Grandview to meet friends from the Confederated Tribes of the Yakima Nation. Margret Gwinn an elder of the tribe and her daughter Sandy were the only ones able to come, others had work commitments. Margret at lunch gifting me a beautiful and rather delicate deer skin pouch that belonged to her mother. But I must tell you the story of meeting Margret and her husband Charles (now deceased) and the Gwinn family. In 2007 I came across the Yakima Nations Tribal land from the west crossing Mount St. Helens. This is primate land the tribes National Forest land that I’d been granted permission to cross saving me from many miles of dangerous road travel. The 5000 mile – 22 month ride as I reflect remains the most arduous travel of all my rides. To say “harrowing,” is an understatement. Ignorance let me to make many mistakes. Illness, injury and inclement weather rode with me Honor and Claire Dog on that journey. So when I came over the Cascades into the Yakima Valley, I looked ragged, tired and thin, we all did. Margret and her daughter Elizabeth were driving home from a day of huckleberry picking when the passed me. They stopped greeted me warmly, offered water to the lowly looking travelers and left. BUT they returned with food and corn and meat and lots of food. They helped me find a suitable campsite off the road and brought buckets of water for Claire and Honor. Trail Angels, Trail Angels who then the next day invited me into their family home where I camped for nearly a week filling up on home, family, tribal love and kindness. One of those stops I shall never forget. I must also share with you this story. Marget and I and Honor saying good bye. Wearing the new shirt that her and Charles bought for me with the new boots in 2007. It was a long hot ride across E. Washington that year. Margret introduced me to the Tribal Council. Where I thanked them for allowing me to cross their land. We toured the countryside and had lunch with other family members in Toppenish but mostly we spent our time in the large back yard where my beloved Honor and Claire rested, ate and were bestowed treats and care through out our stay. Elizabeth brought out a mattress and canopy for me to sleep on when I insisted on sleeping next to Honor. 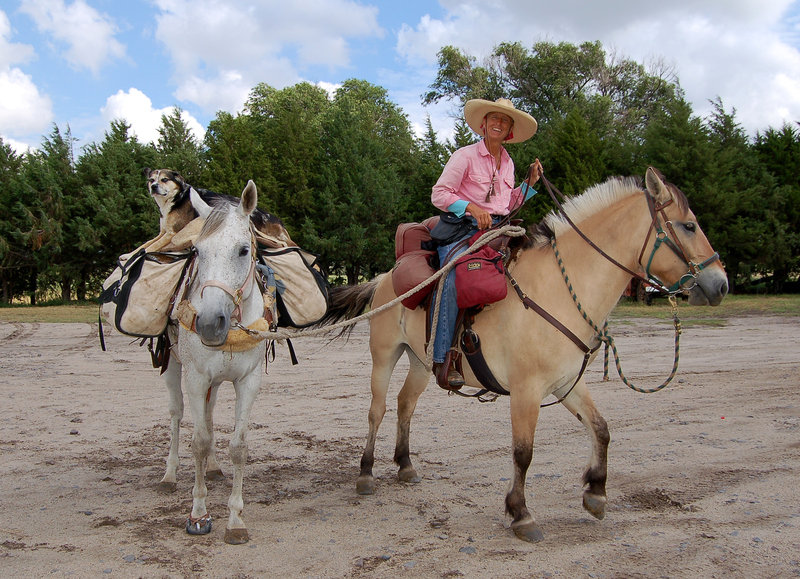 We have stayed in touch thanks to Facebook and in 2009 I returned once again on the 6000 mile ride with two horses and a dog that now rode. The second versions of the DOGIE BOX. The dogie box you see here is one that Elizabeth, Sally and Margret and I pieced together. This arrangement lasted until Texas where another box was rebuilt still using the Indian black and white material the Gwinn’s first added. This rendezvous with Margret meant a great deal to me. As I told Margret, 1000’s of people pass me but only a hand-ful stop, the “Curious and Interested” as I refer to them. These became Trail Angels. Many thanks to the Gwinn family and to the Confederated Tribes of the Yakima Nation for allowing me to cross tribal land. I move on. Washington and Idaho commitments are filled. Next stop Oregon. 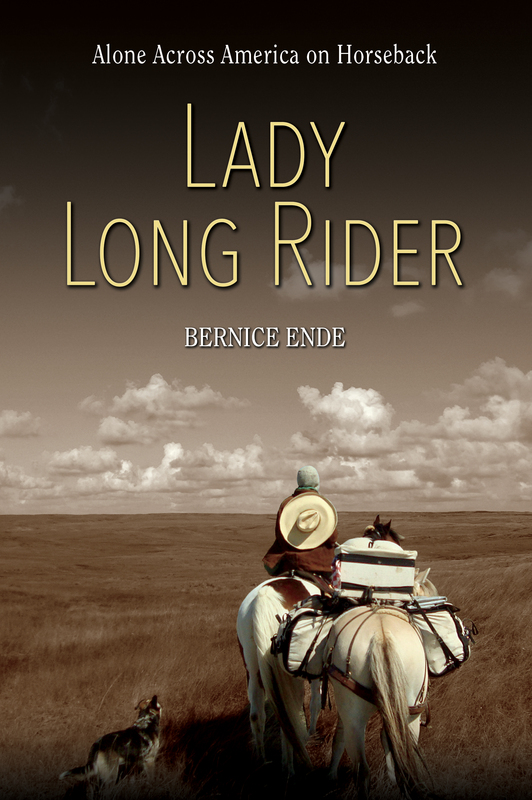 Pendleton is next where I not only do a talk at the Public Library, November 1st at 6:30 but I will also meet up with Rebecca Adams who donated Little Liska Pearl to my rides after I tragically lost Essie Pearl. I simply cannot wait for her to see Liska Pearl and the remarkable change that has come to this little pony. (Although she is not so little anymore.) She is naughty, mischievous, quick to learn and I love her to pieces. She and Montana Spirit have a big sister/little sister relationship and are of course inseparable which is just fine with me because if I have one horse I have two. With Benchmark Maps at my side we make our way ever so slowly thur the countryside. My 1969 Ford pulled us gallantly into Grandview, Washington, home to Smucker, Welch and other fruit packing plants. Yakima Valley College is located here. An enormous irrigation system pulls water from the Columbia and makes possible tens of thousands of acres producing fruit -apples, pears, grapes. It’s a busy area. We travel the back roads at 40 or 45 mph. The horses are not in the trailer over 2 hours. Cashel sent out much needed waterproof blankets they wear in the trailer. We only travel 4 hours on any given day. We exercise twice a day. Plenty of carrots,apples and still much grazing can be done which keeps the girls in good spirits. And now here it is the envy of all those who pass by with your luxurious living quarter horse trailers. The Lady Long Rider Living Quarters Horse Trailer!! Wall ha! Smiles and appreciation to all of you that follow the rides. Hopefully I will see more familiar faces on the book tour. It’s truly humble meeting people who helped me on my earlier rides at my talks. From young women who were once my ballet students as children to the elders like Margret. I am touched and deeply grateful to see you once again and to say, Thank You, Thank You!